Best of Show 2004, A Mountain Quiltfest. 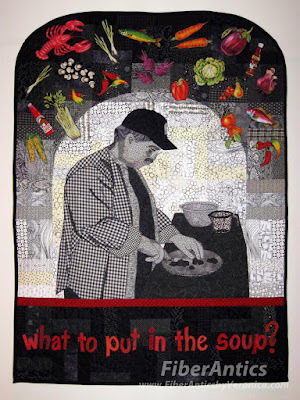 In honor of Larry's (my husband) birthday today, September 24, I've pulled a photo of an all-time favorite quilt, The Chef's Dilemma, from the archives. 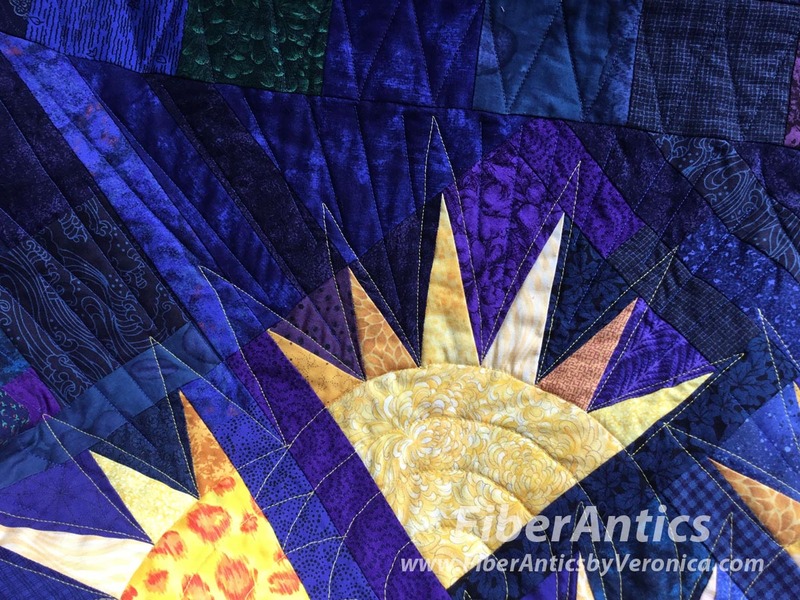 This quilt was made in the fall of 2003, when I was a brand new quilter and a member of my first-ever quilt guild. It was created in response to a Guild Challenge—another concept at the time that was new to me—where it won a first place. What an honor and a surprise for me as the members of this guild were all long-time and very accomplished quilters. 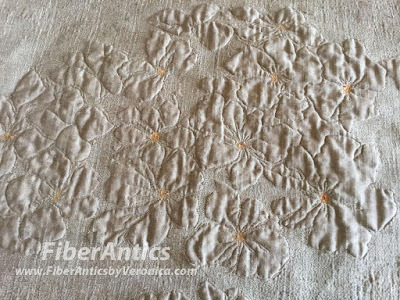 This quilt is a combination of patchwork and raw-edge appliqué [raw-edge means the edges are not turned under as in traditional appliqué]. The quilt is free-motion quilted and straight-line quilted with the walking foot. 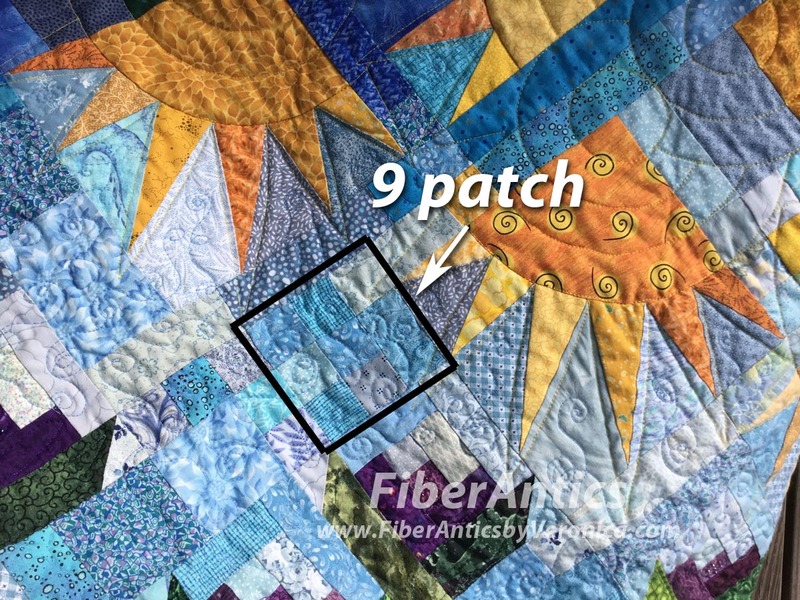 With the popularity of raw-edge appliqué collage quilts these days (see the wonderful collage quilt patterns by Laura Heine), this is a fun and freeing technique for anyone to try, or to revisit if you've not done it is a while! "Fabric Larry" (the working title) then went on to receive the Best of Show at A Mountain Quiltfest in Pigeon Forge, TN in 2004. It was the first time a non-bed-size quilt won the top honor, and it was the most complete surprise and honor for me. I am forever thankful that the SBs (my quilting sisters) were there to support [literally—as I got weak in the knees when I found out it won] and celebrate this amazing accomplishment with me. The Chef's Dilemma was accepted into other quilt shows and exhibits—the McMinn County Heritage Museum quilt show, The Smoky Mountains quilt show, and the Quilts for a Change Zonta exhibit—where it received awards. 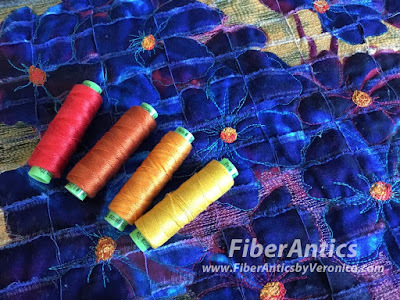 These days, The Chef's Dilemma occasionally comes with me when I teach "Intro to Free-motion Quilting on a domestic machine" or if there is a special Show and Tell at a guild meeting or presentation. And "Fab Lar" is part of the quilt rotation at our house. You'll always be my favorite chef. 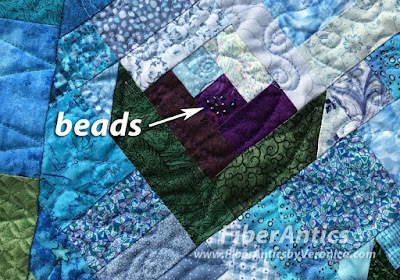 Are you inspired by those beautiful quilting cottons with large scale motifs? You spread open the fabric to see the painterly design and the hand of the artist... then you think to yourself, "but what can I do with it?" Art Weave class—Fabric art with large scale prints. 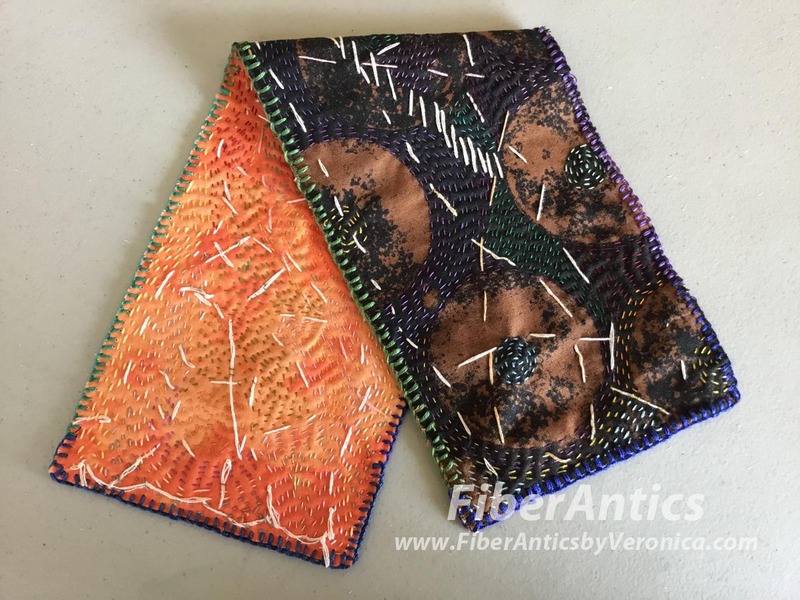 Join me for my Art Weave class and I'll show you a fun (and so easy) technique for using those unique, large scale fabric designs. Call Anna at (706) 217-8111 to register. 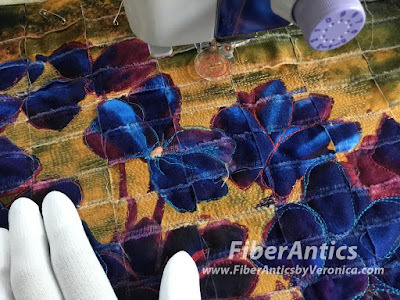 I'd been working on the Violet Bouquet piece (shown above) when my favorite Machingers machine quilting gloves "sprang a leak." ugh! I went to my LQS [local quilt shop] and bought myself TWO new pair. Well, you wouldn't believe the energy and renewed excitement I got when I slipped on that new pair of quilting gloves! Kinda like when you get new underwear—ya feel like a "new woman." So, armed with my new free-motion stitching super power, I began free-motion thread sketching the violets. Free-motion quilting on large scale artisan prints from Frond Design Studios. The background was more heavily free-motion quilted with various 50 wt. threads to let the flowers advance. 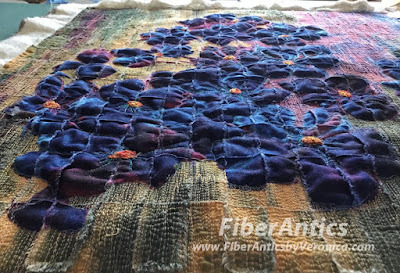 Dimension in the flowers is achieved with heavily quilted background. WonderFil Thread Eleganza, 8 wt. 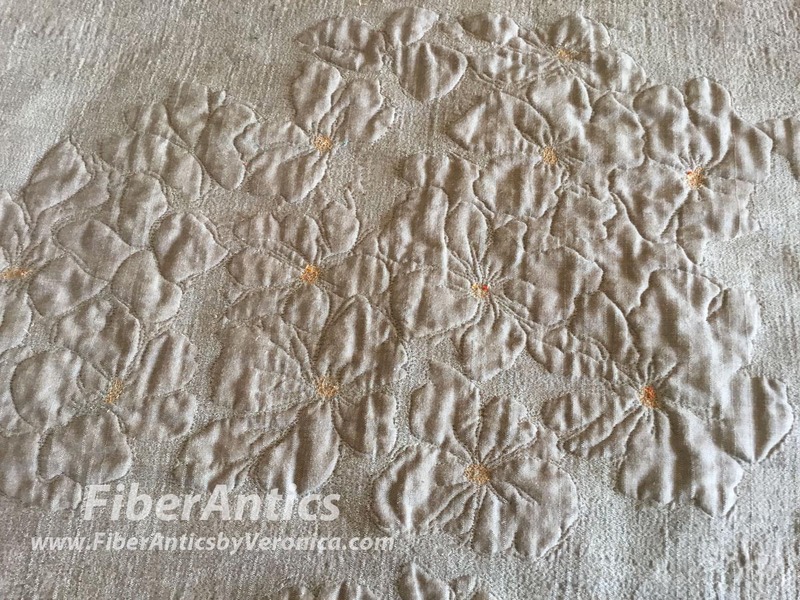 perle cotton thread was used for the flower centers. Eleganza size 8 perle cotton for the flower centers. Here is a view of the back. A yarn-dyed woven from Diamond Textiles is used for the backing and the facing that finished the edges. There's something about a yarn-dyed woven fabric that makes stitching—machine or hand—a dream! Between the DecoBob 80 wt. 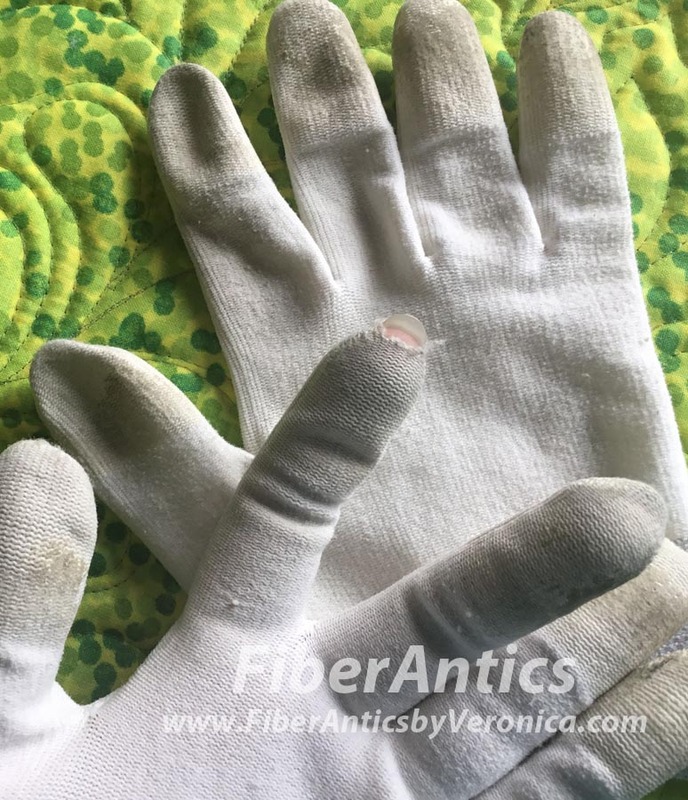 poly thread (by WonderFil Threads) and the yarn-dyed woven (from Diamond Textiles) which allows the stitches to sink into the fabric, the stitches to secure the facing are nearly invisible. DecoBob 80 wt. 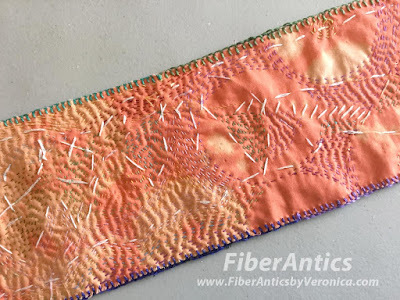 thread for an invisible binding. 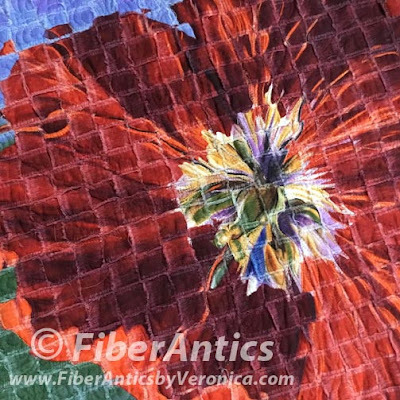 My first Art Weave sample—which you can see in person at Sew 'n So Quilt Shop—uses this red flower design from Frond Design Studios. My Art Weave class works with large scale artisan fabric designs. 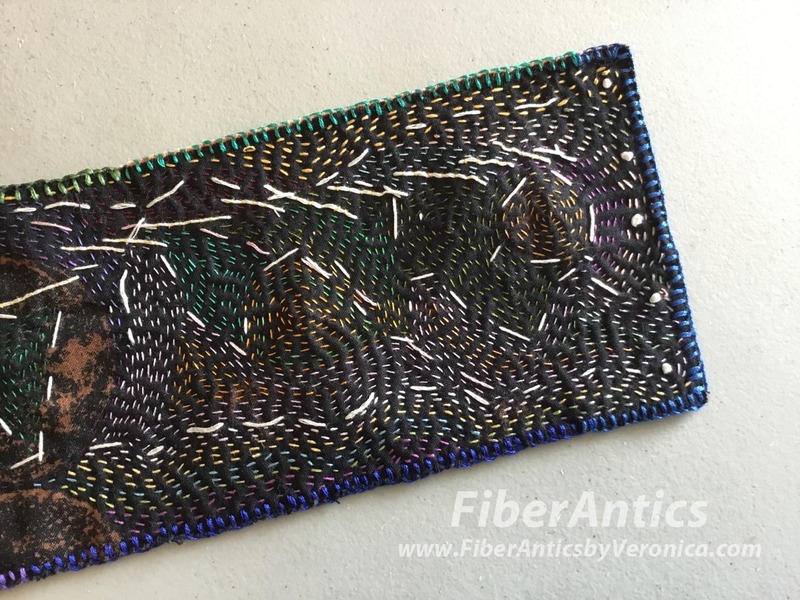 The October 21 Art Weave class is already partially filled. Don't wait to register! All you need are a few simple supplies (you'll get the supply list with the class payment). 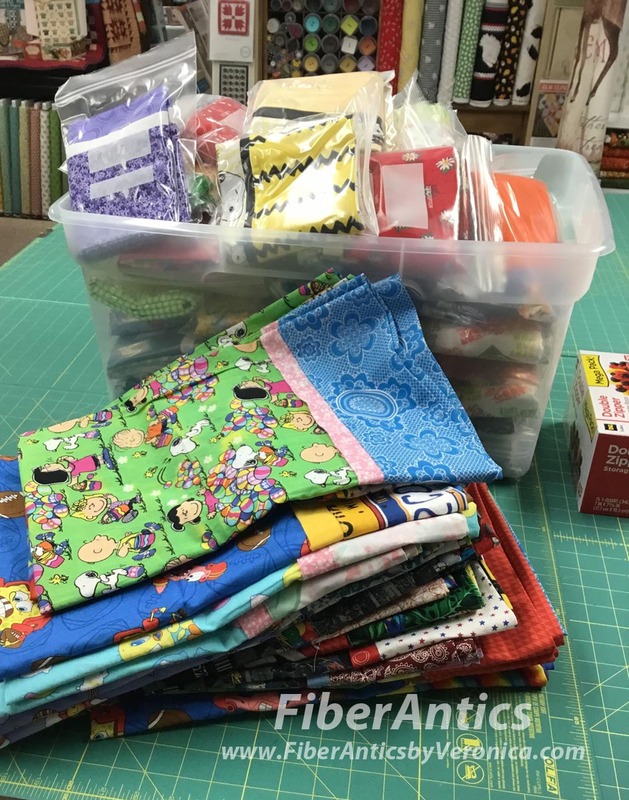 A fabric kit is provided with the class. Call Sew 'n So Quilt Shop at (706) 217-8111 if you want to join me for an artistic experience with large scale artisan fabrics. Pillowcases turned in at Lana's Quilts, Cleveland, TN. 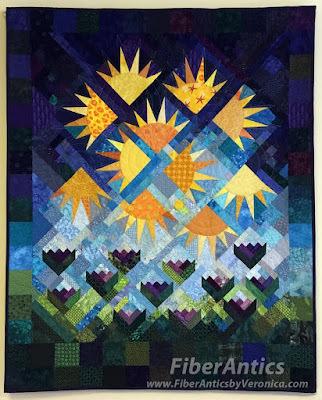 Quilters, quilt guild members and customers are sewing in full force to get behind their local quilt shops in the Chattanooga area, Knoxville area, and Johnson City, Tennessee for The Great Pillowcase Challenge. This is a friendly competition between "The North" (Bernina in Stitches, Stitches 'N' Stuff and Atomic Fibers) and "The South" (Chattanooga Quilts and Lana's Quilts and Sew Much More) to see which "quilt shop team" can collect the most pillowcases that will be donated to local charities and hospitals for distribution to children. I was at Lana's Quilts and Sew Much More this week to drop off one. During my visit, about every hour, someone walked into the shop to drop off stacks—yes, big bags and piles—of pillowcases... 46... 20... 37... It was astounding! Below the cutting table several plastic storage bins were full with colorful, fabric pillowcases, sewn with love by generous, big-hearted sewers and quilters. At today's guild meeting, one of the guild members showed 6 or 7 more that will be added to the collection. 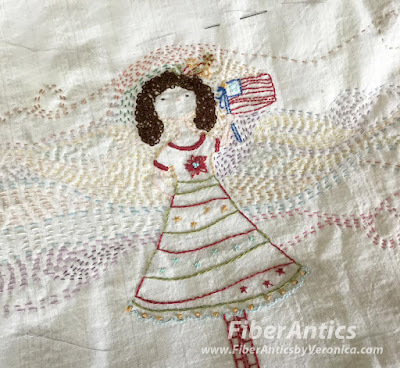 The competition goes through September 16 and each shop owner has graciously offered some kind of incentive—special pricing, discounts, etc.—to customers, quilters and sewers that participate in the Challenge. 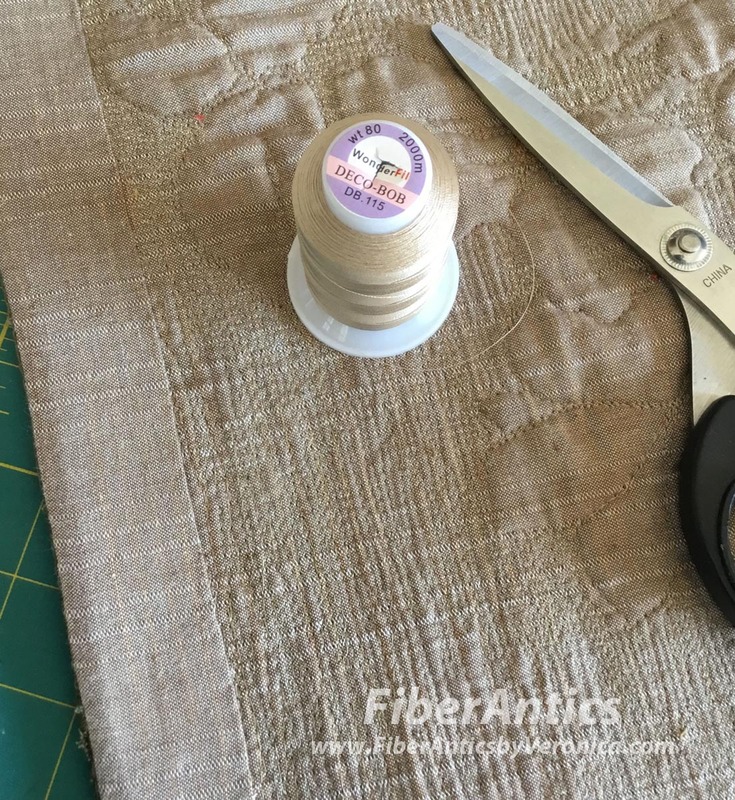 My favorite method for making pillowcases these days is the magical burrito pillowcase method. 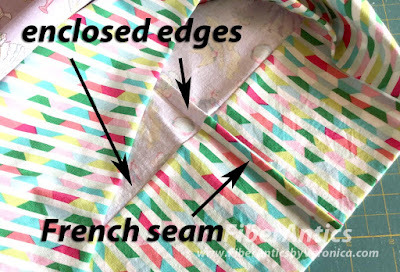 There are only three seams: 1) attaching the band/cuff to the pillowcase body, 2) the French seam on the bottom and side, and 3) part 2 of the French seam that encloses all the raw edges. Clean, neat and fast! 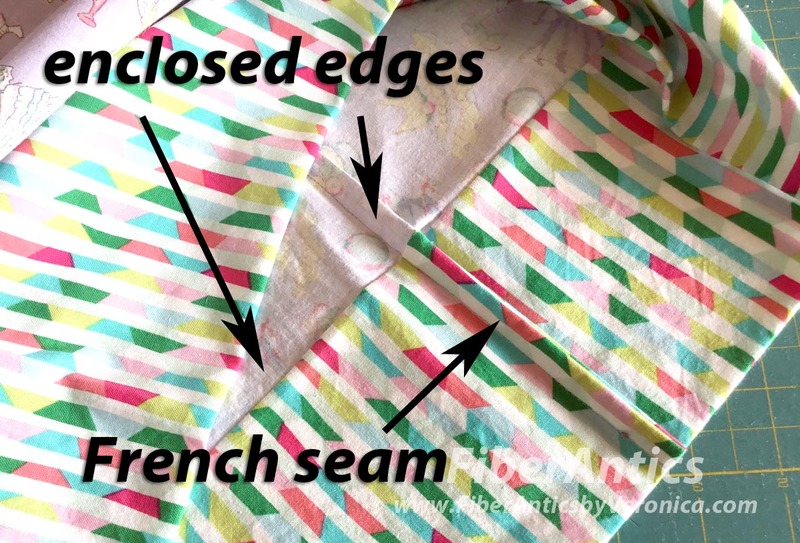 Using the Burrito construction method and French seams leaves no raw edges. While at Lana's shop, I had a few minutes to help fold and insert cases into clear plastic sandwich bags for distribution. The novelty fabric prints made me smile and I'm sure the recipients will love them! 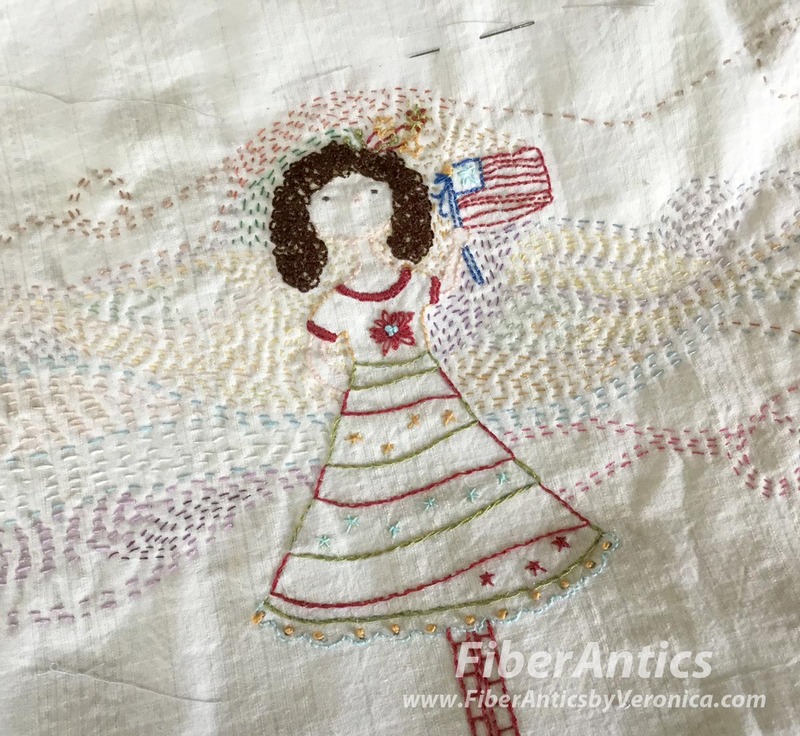 I believe both Lana's Quilts and Chattanooga Quilts are having sew-ins before the competition ends on September 16. Contact these or any of the participating shops and see what they are doing. For a pillowcase, it only takes 3/4 yard for the body, 1/3 yard for the cuff, and 1/8 yard (optional) for an accent trim. The latest update on the score? The South Team is winning with over 700 pillowcases. But with a week to go... it's still anybody's game. Be a winner and join the competition! Any contribution is appreciated. Running stitches. Colored threads. And two pieces of cloth. 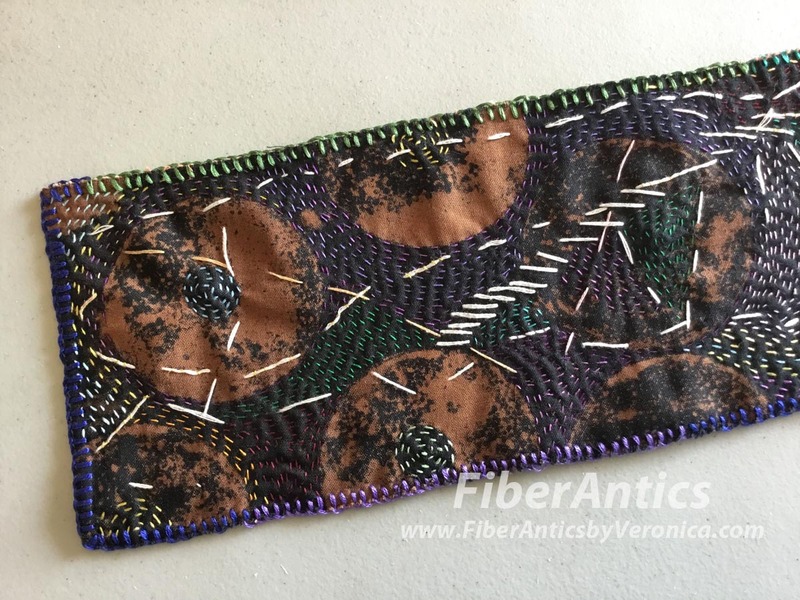 This is one of the stitching exercies from Dorothy Caldwell's workshop. Kantha embroidery on bleach discharged cotton. The fabrics were discharged with bleach. The mark-making tool was a chunk of a pool noodle. A buttonhole stitch finishes the edges. Kantha embroidery piece, 15" x 4.5". To me, the discharged images look like moons... or planets... out in space. Maybe this can be my piece to commemorate the 2017 solar eclipse. My current kantha piece is this Adornit ArtPlay Stitchery from the Calendar Girls collection. The traditional and kantha embroidery is done on a yarn-dyed cotton from Diamond Textiles (PRF-569). 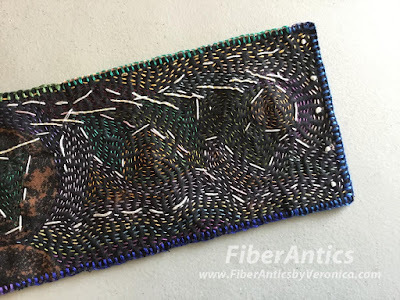 My plan is to fill the background with the Kantha stitching. Kantha stitching surrounds a basic embroidery. 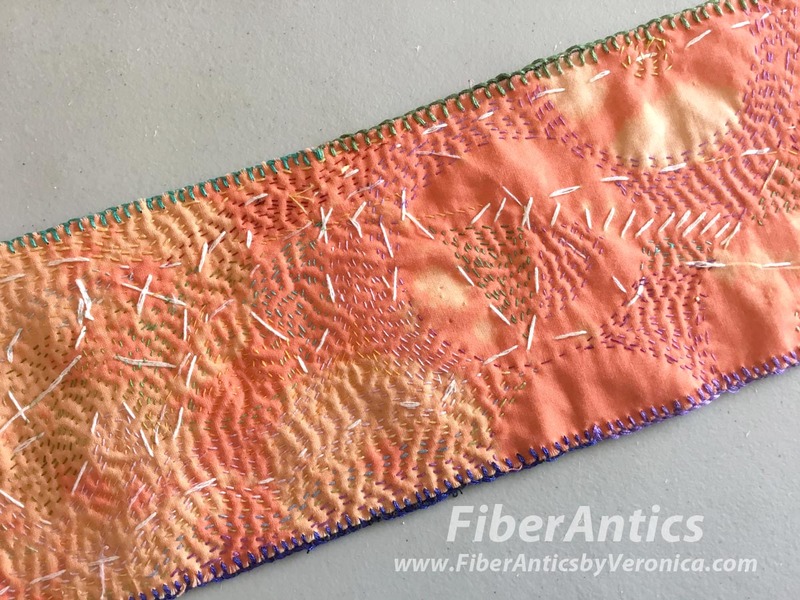 I so love the magic of slow stitching.